I was born and raised in Satellite Beach. 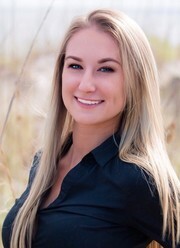 Brevard County has been my home for 24 years, so I am very knowledgeable of the area and the market to guide my clients in the right direction based on their interests. I just graduated from Eastern Florida State College with a Bachelors degree majoring in General Business. My passion is to help others and make selling or buying a home the easiest process for my clients. As a younger agent, I know the current up-to-date aspects as well as technology to make this an easy process.